During Passover, when when bread, pasta, and all sorts of grain products are off limits, it can be very tricky to figure out what to eat. It's a natural response to fixate on the foods you can't use, or to try to replicate favorite recipes with kosher for Passover ingredient substitutions. But it's a lot simpler -- and often more delicious -- to focus on year-round recipes that work for the holiday. The trick is to remember that they're out there in the first place, and to make a mental note -- or even keep a running list -- of favorites. This collection, categorized by both recipe type and key ingredients, will get you started, and help you hone in on year-round recipes that are naturally Passover-friendly. Kosher Note: As of publication time, the recipes on this list are chametz-free, kitniyot-free, so you should be good to go for Passover cooking. Do keep in mind that recipes are occasionally updated, so double check ingredient lists before you get started, to make sure they still meet your Passover standards. 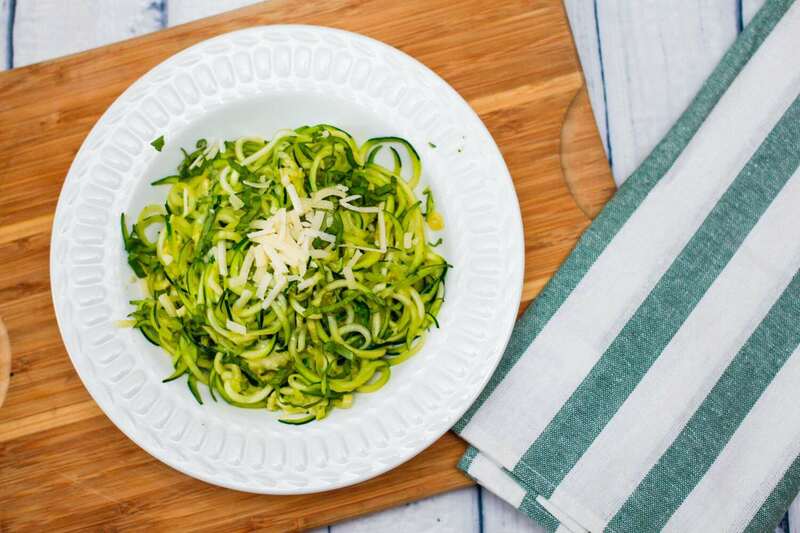 With regular pasta is off limits during Passover, look to spiralized veggies of all sorts to satisfy the craving for sauceable mains, salads, and more. Plus the novelty of spiralizing is a great way to change things up and entice kids (and grown ups!) to eat their veggies. Jewish Zoodle Kugel Recipe -- Eastern European Food Expert Barbara Rolek's zucchini noodle kugel recipe is brightened with lemon zest and fresh herbs, and she even suggests a couple of clever ingredient swaps if you want to make the recipe gluten-free as well as kosher for Passover. Summer Squash "Pasta" With Garlic and Basil -- You can make this recipe with summer squash, or swap in zucchini, if you'd prefer. Try topping the "noodles" with tomato sauce, too. Yes, Passover recipes -- especially desserts like sponge cakes and meringues -- use lots and lots of eggs. So what's a few more when you can turn them into a satisfyingly hearty brunch or breakfast for dinner? The beauty of a fritatta is that you can add lots of veggies, and a single frittata feeds several people, so you won't feel like a short order cook turning out omelet after omelet. Greek Mini Frittatas, adorably baked in mini muffin tins, features red bell pepper, mushrooms, and feta, and make a great grab-and-go breakfast. The simplicity of a sheet pan meal is such a boon during Passover, when kitchen supplies are often limited, and clean up sans dishwasher is a chore. Once you get the hang of this Apricot Lime Chicken, Potato, and Broccoli Sheet Pan Dinner, you can make up your own combos, by swapping in other proteins or veggies. Mashed Cauliflower -- This dish is a literal mashup of cauliflower, potatoes, garlic, and cheddar cheese. In other words, it's totally kid-friendly, a little lighter than regular mashed potatoes, and a great side for fish entrees. Cauliflower "Rice" -- This recipe can be made with a simple box grater if you don't have a Passover food processor. Use it as a side, or as a base for meat or vegetable stews, like this Persian Eggplant and Tomato Stew. Cauliflower Crust Pizza -- Riced cauliflower and ground almonds are the base for this gluten-free pizza. Who says matzo pizza is the only game in town? Ever since quinoa got the okay for Passover use, it's been the darling of the holiday table, thanks to it's versatility and grain-like qualities. Parmesan Quinoa-Stuffed Portobello Mushrooms (Dairy, Passover) -- Roasted portobello mushrooms make a succulent base for a savory quinoa stuffing made with Parmesan cheese, baby spinach, and pecans. Plated upon a small pool of marinara sauce, the mushrooms make an attractive appetizer; add a salad, and you've got a nice, light lunch or dinner that comes together quickly. Quinoa With Arugula, Butternut Squash and Citrus Vinaigrette (Pareve, Passover) -- Serve this as a vegetarian main dish salad, or as a side dish for meat, poultry, or fish. Pomegranate arils (seeds) make a beautiful addition, but if you can't find them, orange sections, sliced fresh peaches, or avocado would be great, too. Blueberry Vanilla Quinoa Bowl​ -- If you've only eaten quinoa as a side dish, you're missing out -- it makes a great hot cereal, too. This breakfast bowl recipe is a great way to use leftover plain quinoa, though it doesn't take long to prepare it from scratch. Never underestimate the power of a good soup to round out a Passover meal -- or star as the center of one! No-Chicken Matzo Ball Soup -- This totally vegetarian matzo ball soup is quicker and easier to prepare than chicken soup, but delicious nonetheless. If you've got a really large stockpot, make a double batch of the soup, so you can use the broth in recipes throughout Passover. Caramelized Onion, Fennel, & Mushroom Soup (Meat or Pareve, Passover) -- Author Kim Kushner's broth-based soup, enriched with caramelized onions and fennel and wild mushrooms sauteed in wine, is simple to prepare, and elegant enough for holiday entertaining. Watermelon Gazpacho -- You can make this refreshingly savory cold soup without a blender. If prefer a classic Tomato Gazpacho this recipe is made without bread, (though it does require a blender or food processor).